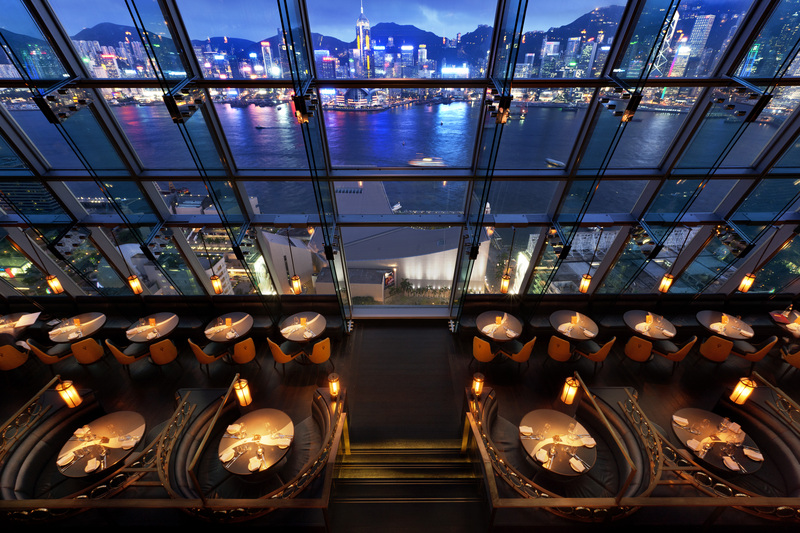 Ozone at the Ritz Carlton in Hong Kong, the highest bar in the world, has a long row of bar stools along its floor to ceiling picture window. You settle on a stool, place your Mojito on the counter in front of you, and stare out at a view of… nothing much. Where is Hong Kong? You lower your sights and, far below you, is a meandering stretch of water lined by buildings. The city that takes your breath away with its architectural glamour from the ground is now so far beneath you, from the 118th floor, that it almost loses impact; I was reminded of looking at Paris from a helicopter once, and pondering that human achievement needs to be appreciated at the scale it was created on. Why do we so love views, and in particular, bars with views? From London’s Shard, you can gaze down from any of three lively and extensive bars at sweeping views of the city, from floors in the mid-30s: a perfect height for admiring a low-rise city like London. 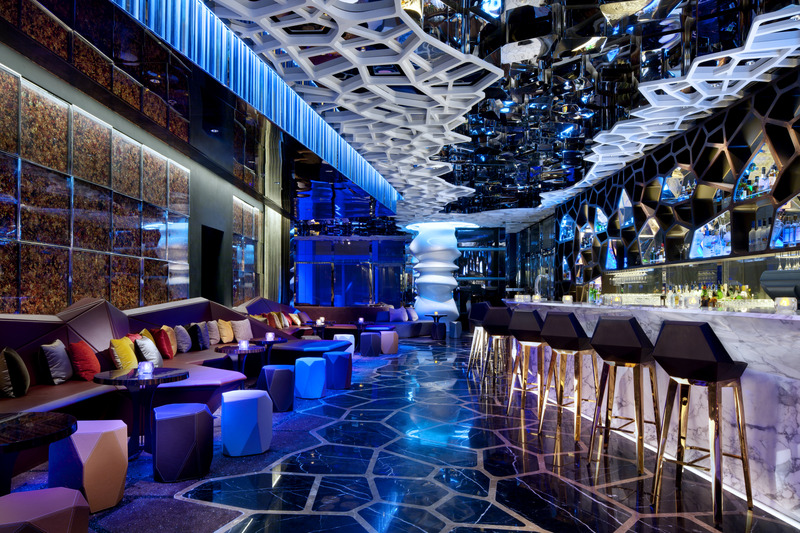 In Dubai, you can head to the Burj-al-Arab’s top-floor bar, and perhaps you will be as disappointed as I was at the tawdry collection of plump men and sad Russian hookers desecrating a surreal vista over the inky Gulf. The Rainbow Room in New York is still the most atmospheric bar with a view in the world, wearing its Jazz Age history on its sleeve (and try drinking Martinis there during an electrical storm for a genuine out of body experience). And perhaps that – slipping out of reality – is why views and bars are so intimately attached. For these watering holes are all in the middle of man-made firmaments, cities aching with crowds and claustrophobia and high anxiety; just as a Beluga vodka Martini provides an escape from the everyday, so does a vista stretching along, above and away. Together, they are an irresistible combination. And so it was at Ozone. Slowly, the eyes adjusted to the relief map of Hong Kong spread out far below. Even in the gallery facing oblivion, the lighting was (correctly) kept low, so you could start to pick out ships and landmark buildings. The crowd was lively: low on suffocating young gents in finance talking about money markets, high on a blend of skin colours and nationalities, out for fun, not for expenses. And, as a slightly disingenuous counterpoint, Ritz Carlton levels of service, which you somehow don’t associate with somewhere so…groovy. Cocktails and champagne whizzed through the crowds with old-fashioned efficiency and deference. My Moscow Mule was refreshing and long, made even more revitalising by a cool breeze blowing in from the open roof. At 490m altitude, it was a discernible couple of degrees less hot than Hong Kong below. 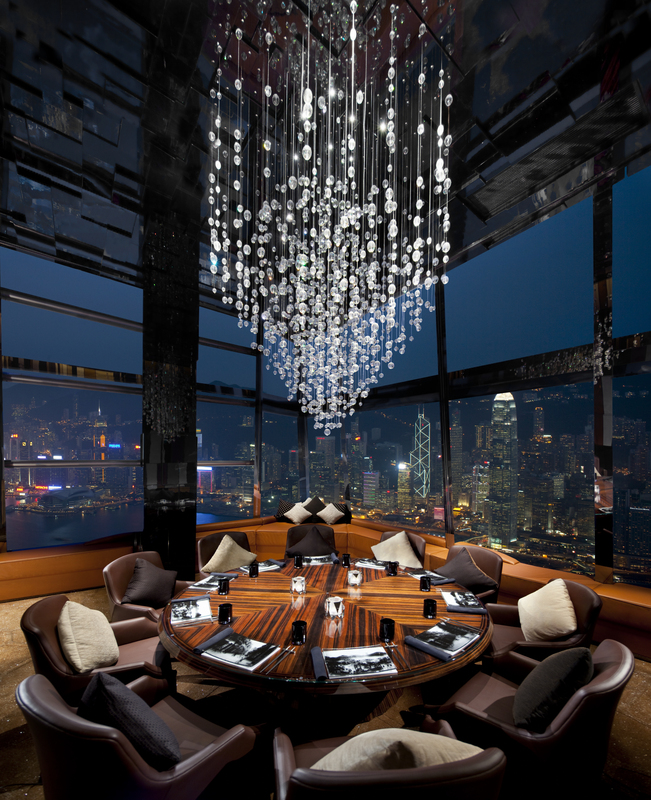 You exit Ozone via the lobby of the Ritz, a surreal interlude of calm elegance, and outside, suddenly, Hong Kong towers over you again. If Ozone looks down at the view, Aqua is the view. This spot, a kilometre or so from the Ritz, is on the 30th floor, some 88 floors below Ozone. Also in Kowloon, the fast-emerging half of the city across the water from the historic centre, the city centre of Hong Kong – known to locals as Central – is a bristling wall of multi-coloured towers. In the foreground, fishing boats, ferries and old Chinese junks chunter through the water, which is multi-coloured, from the reflections of the buildings facing. It is the urban equivalent of being in the heart of the Alps, except instead of glacier whites and granite greys, green, pink and silver neon light up the cityscape facing you and the water below. If you can take your eyes off the view, you will note that Aqua takes its cocktails and food quite seriously. Less of a party spot than Ozone; more of a place for an aperitif that turns into a thoughtful dinner, with good friends. The Moscow Mule here packed a punch, with real ginger and a dab of mint, and one of my favourite vodkas, Ketel One, still made in an old gin pot still. It adds texture and class. The chef’s selection of sushi came with an instruction not to ask for wasabi as it mars the flavour; the lobster, wagyu beef and toro nigiri were indeed delicate, buttery, nutty, gentle. For all the correct international conversation about human beings desecrating the planet, and the follies of modern urbanity, an evening at Aqua may lead you to conclude that humans are still capable of adding beauty, soul, and delight to the world. And that this bar high in the heart of Hong Kong is one of the very best places to appreciate that. Meanwhile, a good friend tells me that the bars on the other side of the expanse of water are less spectacular, but more edgy. To be continued..